After sleeping for slightly over 12 HOURS last night, I awoke still having a headache. That isn't stopping me though...on to day 3 of paleo eating! 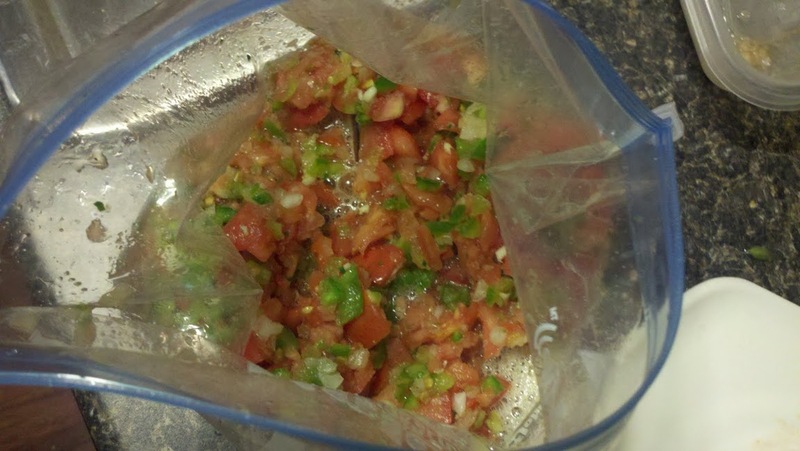 Our dinner tonight is consisting of pork loin, so Rebecca started getting that reading in the crock pot while I made some homemade salsa (which is going with our breakfast of leftover chicken). It was pretty good, but next time I make salsa, I think I need to take it a little easier on the onion and jalapeno...just a bit too much for our taste. Next time I'll add those slowly at the end until I figure out how much is enough. Our breakfast of chicken and salsa was very good, but I've got to say, it's definitely weird to eat that type of food for breakfast. We then went about our day, for me that meant pool and yard work, Rebecca was cleaning the house. Lunch was pretty basic, but very good...tuna and salad. Rebecca has really been craving chocolate, so after seeing this "decadent fruit dip" recipe, we went out to a local health food store to pick up some coconut milk and coconut flour. She followed the recipe exactly and made half white dip and half chocolate dip. We put it in the refrigerator to get cold so we could enjoy it later. At some point this afternoon, my headache mostly went away. It's not pounding any more, but if I shake my head from side to side, I definitely still feel it. For those of you keeping score at home, it's been about a day-and-a-half of pounding headaches. I'm also not nearly as lethargic as I was for the first couple days. For dinner we had the pork loin that had been simmering in the crock pot all day (along with tomato sauce, zucchini, cauliflower, and basil) and it was AMAZING. I think I'm going to start using Evernote to keep a list of everything we're eating on this diet (along with the recipe) and score them by both how much we like them and how easy they are to prepare. That will give us an easy list to work from for future meals beyond the 30 days (remember, we're following the 30 day meal plan in The Paleo Solution). After dinner we each had a cut up apple with the previously mentioned dip. I thought it was pretty great...the regular one tasted better than the chocolate one. Sunday morning, for breakfast we had some scrambled omega 3 natural eggs and blueberries. This was one of the best breakfasts I've ever had. I know I'm saying that a lot...I don't know if my tastebuds are changing or if I'm just enjoying food more. The best part of the day was the steak. And not just because it was steak, because we put Tamari sauce on it. 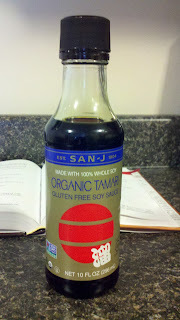 Tamari is wheat-free soy sauce. It's very rich with a nice smokey flavor to it. I've never had Tamari sauce before, and let me tell you...I'm never going back! Previous to today, I would have bet my life that I would never consider anything superior to A1 for steaks. Today, I would have lost that bet.